Now that he’s the size of a sapling, Groot is going through some growing pains and acting out. You know, the way any rebellious and sentient teenage tree might when he’s traveling through the boring bits of outer space in between the exciting battles. Plot: The Guardians are each struggling to deal with their baby tree friend, now that he can’t seem to grow any faster and is simultaneously acting his size. Between engaging in imaginary space battles while Quill is away and trying to play hide-and-seek with Gamorra, I Am Groot shows a team at their wits’ end when it comes to the shared custody of their sapling. Story: The issue starts strong, exploring Groot’s restlessness and feelings of unworthiness now that he’s stuck in his smaller form. Christopher Hastings does some excellent worth both with Groot’s own characterization, and with contrasting how different members of the team interact with their little friend. Rocket’s bond with him is especially compelling, so it’s almost a shame when the character work is cut short by the inciting incident. The protagonist being separated from the other Guardians makes for an interesting plot, but instead it seems he finds himself in the care of yet another handler right off the bat. I personally felt the plot starting moving a little too quickly once he landed on the new planet, but perhaps Buddy will wind up bringing a fun element to the story. Having a character who isn’t used to Groot’s version of language does make for some friction and it’s enough to keep me invested in the second issue at least. Art: The importance of artwork cannot be overstated in a series like I Am Groot, considering that the title character only speaks three words. 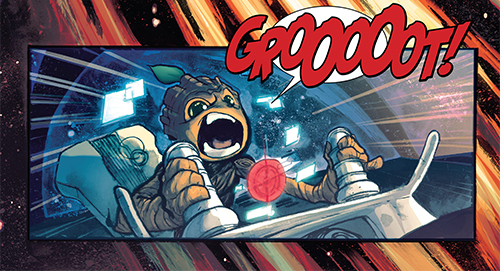 Every panel has to be meticulously worked so that the meaning behind Groot’s exclamations can be understood even when Rocket’s not around to translate – and Flaviano is certainly up to the task. Groot’s expressions throughout are both humorous and believable, expressing the appropriate emotions if not contributing to an exact translation. Marcio Menyz’s coloring is also incredibly appealing, turning the backgrounds of every page into much more than empty or dead space. 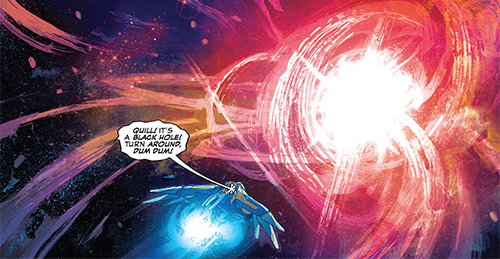 Despite the lack of detail, the brushes of vibrant color add to the feeling of literally moving through space. The lettering also keeps the issue feeling fresh, and Joe Caramagna finds a myriad of different ways to write “I am Groot” without getting repetitive. 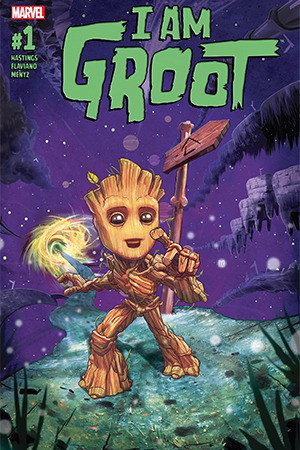 Verdict: While the layered characterization for Groot got a little lost at the end of the issue, I Am Groot #1 set up an interesting almost-story for everyone’s favorite sapling. Will Groot and his new friend Buddy be able to make it through Terminal’s world on their own, or are the Guardians going to have to come to the rescue? With Christopher Hastings at the helm, readers can expect a lot of laughs on their way to an answer. 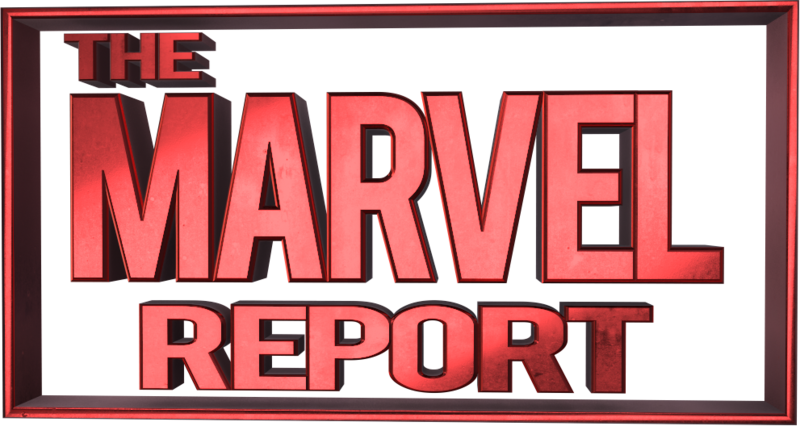 REVIEW: Captain America: Steve Rogers #17 – “Don’t Change That Channel!